This issue features the return of two former Flash villains, although, technically in this story, only one of them is a true villain, which neatly walks me smack dab into the point I wanted to make about this tale. About the first villain, Professor Zoom the Reverse Flash, there is no doubt. He’s a villain through and through and destined to become the baddest of the bad guys for the Flash, but, with Mr. Element, it’s a much different story. As the story opens, Barry and Iris are meeting with Al Desmond and his girlfriend Rita for dinner. 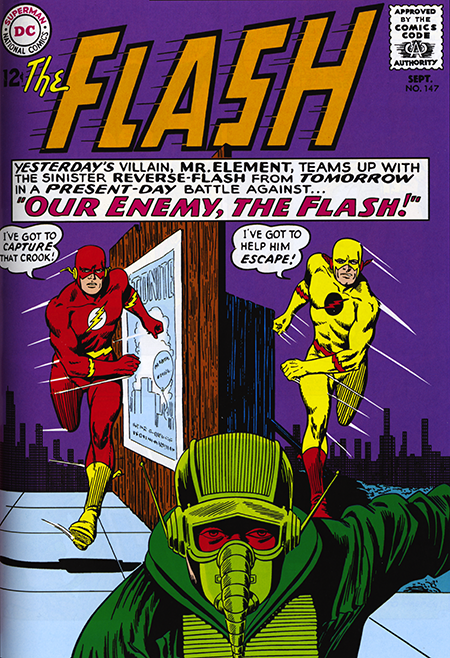 As readers of this blog will recall, Desmond first appeared as the Flash foe Mr. Element and then again as Dr. Alchemy. He’s also the first Flash fiend to turn over a new leaf and go straight. But, as we all know, it’s hard to turn over a new leaf when you live in a jungle, and Desmond’s best laid plans come a cropper when Professor Zoom shows up from the future needing the help of Mr. Element to help him retain his super speed. Zoom uses his mental energy to force Desmond to become Mr. Element again and do his bidding. And we have finally arrived at my aforementioned point which is that this could have quite easily been written as two bad guys beating up on the Flash, but right out of the gate author John Broome established the fact that Al Desmond has rejected his life of crime and wants to go straight. This twist turns the work into a much more compelling story. As my younger self read this, I found myself really pulling for Desmond to catch a break and somehow let everyone know that he really hasn’t become a criminal again. Broome had created a compelling character here that you empathized with and didn’t want to see come to harm. The writer went fishing for my emotions and I bit hard, hook line and sinking feeling. It made for a much more emotional story than a simple straightforward superhero matchingwistsfest. When the Flash finally realizes that his reformed friend has been under the control of the villainous Zoom, there’s a palpable sense of relief. It does what a good story should do. This is just one small example of why I hold Broome’s work in such high esteem. I never got the chance to meet him, but back in 1999 our paths almost crossed. We were both scheduled to be guests at Comic Con in San Diego, when my appendix intervened and decided that I wasn’t going anywhere except to the hospital. I understand that Broome’s panel at the con was standing room only with a large percentage of the people being writers who had grown up admiring Broome’s work. Makes perfect sense to me. I only wish I could have been there to add to the hosannahs.